April 6th (Sat) -- Shelton -- Harstine Island 1/2 Marathon. 8:00 AM. $30. 2019 RESULTS. April 6th (Sat) -- Heritage Park, Olympia -- 1st annual Thin Mint Sprint 5k run/walk. 9:30 AM. $27.50. 2019 RESULTS. April 6th (Sat) -- Firecreek Ale House, Lacey -- Will Run for Thurston County Food Bank. 8:00 AM. $10 Suggested donation. April 13th (Sat) -- Adna -- Back Park Pirate Race and Seadog Dash 5k and 1/4 mile kids race. $10 ($25 for 4 family members). 10:30 AM. April 21st (Sun) -- Orting -- Sporty Diva 6.55 mile, 13.1 mile and 26.2 Mile. April 27th (Sat) -- Capitol Forest -- Capitol Peak 50 mile/25k. April 27th (Sat) -- Mt. View Church, Tumwater -- Race Against Trafficking 5k. $29. 9:00 AM. 2018 RESULTS. May 3rd (Fri) -- St. Martin's University, Lacey -- It's On Us 5k Run/Walk. $15. 9:00 AM. May 4th (Sat) -- Capitol Building, Olympia -- 32nd Annual YMCA Spring Run 10k/2 mile and Kids run. $32. 8:30 AM. 2018 RESULTS. May 4th (Sat) -- Grace Covenant Church, Olympia -- Global 6k run/walk for World Vision. 9:00 AM. $50 Donation. 6K course map. May 18th (Sat) -- Medina -- RGI 5k RUN. $35. 9:30 AM. May 18th (Sat) -- Heritage Park, Olympia -- Capital City Kids 1.2 Mile Kids Run. 4:00 PM. FREE! May 19th (Sun) -- Sylvester Park, Olympia -- Capital City Marathon, 1/2 Marathon, and 5 mile. May 19th (Sun) -- Orting -- 5k for the Fallen. $40 (Free 1/4 kids dash). 9:00 AM. May 30th (Thur) -- Olympia HS --All-comers Track & Field Meet. 6:00 PM. AC#1 2018 RESULTS. June 1st (Sat) -- Roosevelt Elementary, Olympia -- 6th Annual Roosevelt Roadrunner 5k. June 1st (Sat) -- Shelton -- Goldsborough Creek Run/Walk (7 mile, 2 mile, 1/4 mile kids race, 1/4 senior walk). 7:00 AM. $25. 2019 REGISTRATION LINK. June 2nd (Sun) -- Washington Correctional Center, Shelton -- 15k Race with Inmates. Free. Contact elhammargren@DOC1.WA.GOV for details and entry. June 9th (Sun) -- Heritage Park, Olympia -- Madison Mad Dash 5k and 2.5k.$30/$20 (under 5 free). 2018 RESULTS. June 13th (Thur) -- Olympia HS --All-comers Track & Field Meet. 6:00 PM. 2018 AC #3 RESULTS. June 15th (Sat) -- South Bay Grange, Lacey -- Strawberry Short-K (5k). $20. 9:00 AM. June 15th (Sat) -- Chehalis-Centralia Airport -- Leap the Levee 5 Run/Walk. 9:00 AM. $20. June 20th (Thur) -- Olympia HS --All-comers Track & Field Meet. 6:00 PM. 2018 AC #4 RESULTS. June 22nd (Sat) -- Heritage Park, Olympia -- ROAD-odend-RUN 6 mile relay and solo SUMMER EDITION. $15 Solo/$25 Team. Free Kids 1/2 mile and 1.5 mile races. 9:30 AM. Feb. 2019 RESULTS. June 27th (Thur) -- Olympia HS --All-comers Track & Field Meet. 6:00 PM. 2018 AC #5 RESULTS. June (Sat) -- Thrive Fitness, Lacey -- Thrive Freedom 5k. 9:00 AM. 2018 RESULTS. June(Sun) -- Lakewood -- You Matter Movement 5k and 1/2 Marathon Run/Walk. 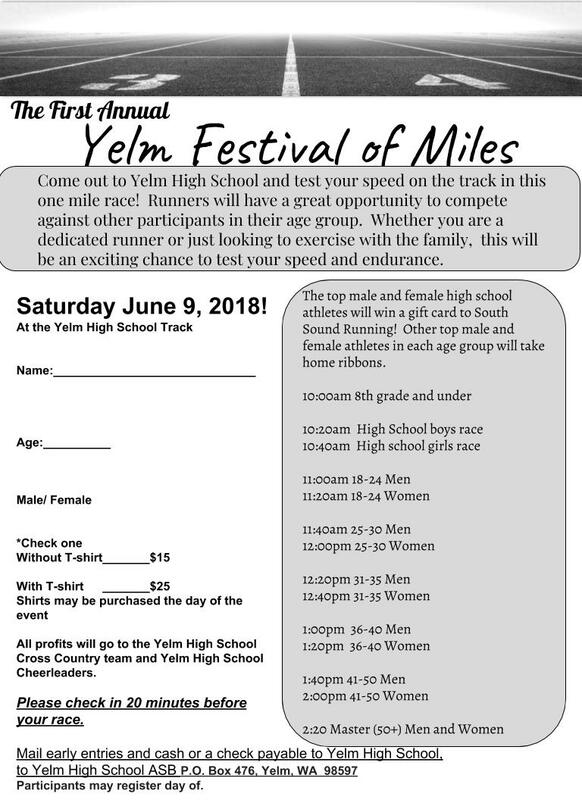 June(Sat) -- Yelm -- Festival of Miles 1 mile races. July 4th (Thur) -- Capitol campus, Olympia -- Firecracker 5k. 2018 RESULTS. July 4th (Thur) -- Steilacoom -- 31st annual Four on the Fourth.9:00 AM. $15 (4 mile), $5 (1 mile). 2018 RESULTS. July 4th (Thur) -- Tumwater Valley Golf Course, Tumwater -- Fairways and Fireworks Fore on the Fourth 4 mile. July 20th (Sat) -- Heritage Park, Olympia -- Lakefair /2 marathon, 8k, and 3k. 7:00 AM. July 20th (Sat) -- Buckley -- B & O Half Marathon and 10k. July (Fri) -- RAC, Lacey -- Grow in the Dark 5k and kids race. 8:00 PM kids race and 9:00 PM 5k. July (Sun) -- Westport -- Run Like the Wind 5k/10k. August 10th (Sat) -- LBA Park, Olympia -- Olympia's Backyard Adventure (3.6, 11, or 18 mile trail races). $25-$35. 8:00 AM. August 24th (Sat) -- Parkland --11th annual Parkland Pace or Race 5k. 9:30 AM. $15. 2018 RESULTS. August (Sat) -- Heritage Park, Olympia -- Mustache Dash 5k. August (Sat) -- Shelton -- Beast of Big Creek 21k and 7 mile. 2017 RESULTS. August (Mon) -- Olympia to Yelm -- 4 Man/3 Bike Relay. 2018 RESULTS. August (Sat) -- Issaqua -- Crush the Hill 5k. August (Sat) -- Lacey -- Run Like a Dog 5k. 2018 RESULTS. Augutst (Sun) -- Priest Point Park, Olympia -- Watermelon Rumble 5k and 10k. 9:00 AM. $10. September 7th (Sat) -- Auburn -- Pacific Runderland 5k and 1k Kids Run. $25. 9:00 AM. September 8th (Sun) -- Washington Correctional Center, Shelton -- 1/2 Marathon Race with Inmates. Free. Contact elhammargren@DOC1.WA.GOV for details and entry. September (Sun) -- Chehalis Western Trail -- Sporty Diva Bad Azz 5 mile,13.1, 26.2, and 50k. September (Mon) -- Chambers Creek neighborhood, Olympia -- 5th Annual Chambers Creek Crossing 1 mile kids race. 2018 RESULTS. September (Sat) -- Capital High School, Olympia -- Capital Invite Cross-Country Citizen's race 2.33 miles. September (Sat) -- Heritage Park, Olympia -- Kokua Poker Fun Run, Walk, and Roll. September (Sat)-- Tacoma -- Free to Breathe 5k. September (Sat) -- Heritage Park, Olympia -- Glow Run 5k. October (Wed) -- LBA Park, Olympia -- 1.0 Mile Youth X-C. 2018 RESULTS. October (Sat) -- Heritage Park, Olympia -- Beat Beethoven's 5k Run & Walk. $35. 9:00 AM. October (Sat) -- St. Martins University -- Bill Kehoe/South Sound Invitational Cross-country Community 5k. 2018 RESULTS. October (Sun) -- Shelton -- Shuck & Share 5k. RESULTS. October (Sat) -- Centralia -- Mario Madness 5k Fun Run. 10:00 AM. $15/$25 and group/family rate, Free Kids race. October (Thur) -- Shelton -- Huff N Puff 2 mile footrace (Grades 3-8). October (Wed) -- LBA Park, Olympia -- Bruce Newman Memorial 1.5 Mile Youth XC Race. 2018 RESULTS. November (Sat) -- Orting -- Turkey Trot 5k, 10k, 1/2 Marathon. November (Thur) -- Heritage Park, Olympia -- Oly Trot 4 mile. 2018 RESULTS. December 1st (Sun) -- Washington Correctional Center, Shelton -- 5k Race with Inmates. Free. Contact elhammargren@DOC1.WA.GOV for details and entry. December (Sat) -- Grace Covenant Church, Olympia -- RUN-dezvous 5k and 1 mile. 2018 RESULTS. December (Sat) -- Capitol Forest -- Porter Creek Trail Runs 5k, 10 mile, 25k. 8:30 AM. December (Sat) -- South Sound Running, Olympia -- 9th Annual White Elephant Run 5.0 Mile. 9:00 AM. $5. 2018 RESULTS.